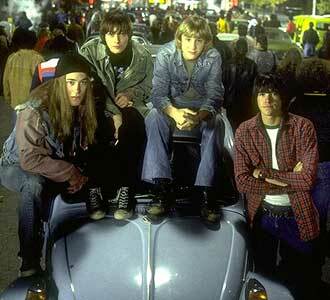 Edward Furlong, James De Bello and Cody Jones wear black high top Converse “Chuck Taylor” All Stars in the film. Hawk is the leader of four young rockers trying to get to a KISS concert in Detroit. Detroit Rock City is a film about four teenaged rockers living in the Cleveland, Ohio suburbs in the late 1970s who are determined to attend a concert in Detroit given by their favorite band, KISS. In their opening scene, we meet the group led by guitarist Hawk (Edward Furlong), rehearsing in a garage (where else could it be? ), and tripping out on their own particular brand of loud rock. The rest of the band is made up of long-haired Trip (James DeBello), Lex (Giuseppe Andrews), and drummer Jam Bruce (Sam Huntington). The premise of the film is based on one of the pop music cultural conflicts of the era. The seventies was the age of disco for most of America, but there was a subculture of rockers in their teens and early twenties who despised the softer commercialized sound, flashy dress, and “dance ’til you drop lifestyle” of the disco movement. One of the main bands of this rock counterculture was KISS, and their black and white painted faces, loud music, and anti-establishment attitudes were thought to be the work of the devil by many conservative religious groups. This attitude was represented in the film by Jam’s mother (Lin Shaye), who is determined to keep her son off the road to perdition. She belongs to a militant parents’ group called Mothers Against The Music of KISS, who think that the band’s name stands for “Knights In Satan’s Service”. As the film opens, we see her walk downstairs late at night, and put on a record album thinking that she is about to hear some pleasant music from the fifties, but instead the record changer plays a KISS album, which absolutely freaks her out. Trip, Hawk, Jam and Lex outside the concert hall in Detroit. Hawk and his friends have obtained tickets to the KISS concert at great expense but are worried that their parents, especially Jam’s mother, will find out about them and prevent the boys from going. So they have taken great pains to hide the tickets, but unfortunately were stoned at the time and can’t at first remember where they are. Jam has left them in his faded and torn Levis jacket, which his mother absolutely hates and wants to throw away. She has purchased a new outfit for him at K-Mart, and orders him to wear the new clothes to school the day of the concert. Later, in a hilarious scene that at first seems like a dream sequence, Jam’s mother has found the tickets, comes to his school, grabs the school public address microphone, and announces to the entire community that she has personally destroyed the tickets and that Jam is to be sent to Catholic boarding school as a last ditch effort to save him from the devil. This public humiliation doesn’t stop the boys from pursuing their dream of attending the concert for long. They win a radio contest for concert tickets based on some rock trivia, and head off to Detroit, rescuing Jam from an interview at the St. Bartholomew’s boarding school by using the old pizza boy delivery trick as a way to get in. When they reach Detroit, and go to the radio station they face another setback. Even though they won the contest, they forgot to stay on the line and leave their names with the station, so their tickets were given to the next caller. But the boys are still confident that they can get into the concert, and each of them agrees to separate and figure out individually how to get into the concert. At this point, the film splits into separate vignettes for each of the boys. Hawk tries to buy from a ticket scalper, and ends up participating in a male stripper contest to raise money. Trip becomes an unlikely hero after trying to take tickets from a little kid at a convenience store. Lex tries to enter the concert hall by sneaking past security using the old “help carry an instrument in” bit, but ends up saving a disco girl that they had picked up on the way to Detroit from a pair of car thieves. Jam has a confrontation with his mom who is picketing outside the concert hall with her anti-KISS group but ends up meeting and falling in love with his school classmate Beth (Melanie Lynskey) who happens to be in town with her family. The remainder of the film deals with the resolution of all of these subplots, and the four friends’ final attempt to attend the concert. Trip tries to hustle a young KISS fan out of his concert ticket, not realizing that he has a huge older brother. If all of this seems to be greatly contrived, it is. The film is a good example of the Ferris Bueller’s Day Off syndrome. For all of the things that happen in this film to actually occur in the given time frame, there would have to be about 36 hours in a day. This film also owes a certain debt to predecessors like Wayne’s World and Bill & Ted’s Excellent Adventure. While the final resolution is never in doubt, Detroit Rock City will delight those who like raunchy teen road comedies with a lot of energy if not a lot of logic. Director Adam Rifkin keeps the action happening almost all of the time, which lets you forget the fact that most of the characters are stereotyped and the screenplay has one unreal coincidence after another. The realism of this film is in the way it portrays the attitudes, music, and lifestyles of punk rock teenagers in the seventies. But if you are offended by such things, be aware that this realism includes the widespread availability and acceptance of marijuana use and easy sexual promiscuity before the onset of AIDS. Edward Furlong and Sam Huntington both deliver well acted performances which are credible because the film actually allows their characters to show some development and coming of age as they learn to stand up for themselves and their beliefs. For KISS fans of all ages, Detroit Rock City is a video tribute that will join the albums, posters, action figures, and comic books that make up their mystique in the rock music world. Hawk starts doing a striptease to get money for the KISS tickets. Hawk retaliates against the disco guy who rubbed his face in the pizza. As with any film about punk or metal rockers, the black Converse All Star high top has a place, and Detroit Rock City doesn’t disappoint in this regard. Both Edward Furlong in his role as Hawk and James DeBello in his role as Trip wear chucks throughout the film. In his black KISS t-shirt, black Levis, Army surplus fatigue jacket, and black chuck high tops, Hawk represents the typical “well-dressed” punk rocker. The best chucks scene occurs on the way to Detroit, when the four friends have a run in with some disco-loving people. At first the disco guy has the upper hand, rubbing Hawk’s face into a piece of pizza that got splattered on the disco guy’s car. But then Hawk decides to stop taking it, and fights back very effectively, turning the entire situation around into a rout of the disco guys. During the fight, the camera pans down to a shot of Hawk’s Chuck Taylors squared off against the other guys polished disco boots that serves as an analogy for this confrontation of life styles. Hawk comes of age when he begins to stand up for himself against the disco guy. Detroit Rock City. (1999) Edward Furlong, Sam Huntington, James DeBello, Giuseppe Andrews, Natasha Lyonne, Melanie Lynskey, Lin Shaye, Gene Simmons, Paul Stanley, Ace Frehley, Peter Criss, Cody Jones. Directed by Adam Rifkin. Categories: Drama, Teenagers. Black high top chucks rock! To order a pair or two click on the shoe link below.